It was interesting that the newly leaked bubble chart illustrating supposed reasons for people leaving the "gospel" pointed the finger completely at forces external to the church. Blame is cast on specific individuals who are named as enemies to the church, as well as things like cultural shifts/trends and non-correlated beliefs...moreover, blame is placed on the individual members, due to their personal weaknesses, failures, or shortcomings. There is not a single bubble on the chart to suggest that the church itself might have something to do with the attrition of its members. 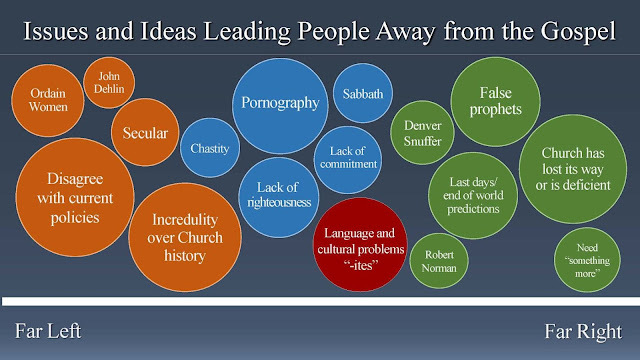 Perhaps the paid consultant tasked with this project feared for his or her own livelihood if s/he were to dare to suggest that a major factor in a person's decision to walk away from the church is likely the church itself, which may then in turn give rise to many of the issues presented in the bubbles. Just like in human relationships, if we are finding that we are having trouble with someone else, it's probably time to take a good look at yourself in the mirror and start working on you. Casting blame on others for our problems only makes things worse and interferes with healthy interpersonal relationships. When the church starts honestly facing and dealing with its own issues, and stops blaming others for its shortcomings, only then it can begin to serve as the example of righteousness it claims to be. In the meantime, those who are seeking honest answers, a deeper and more meaningful connection with God, and a happier and healthier lifestyle will continue to look elsewhere and find their own path out of the church. Nicely done! It's like Elder Uchtdorf's talk about being off course by 2 degrees . . . If you're not willing to course correct, you're not going to make it to your original destination. Thank you James. I like the alternative chart. . . well said! The first bubble chart shows "what's wrong with the people". (Church leaders embrace that chart. More of Brigham Young's "finger-pointing".) The second chart deals with the Church (its leadership, what's wrong with the organization, not the people). The second chart is more reflective of reality. "Sin", by itself, doesn't keep people from coming to church any more than sickness keeps people from going to a hospital. But when the hospital itself gets "funky" -- and stops healing people (and even starts killing them) -- that's when the people start "checking out". Nobody goes to the hospital to get WORSE. But THAT'S what the LDS Church has become: nice-smelling essential oils and strange homeopathic remedies masquerading as real medicine.